An online, 11-month class with live weekly class calls and group interaction. We will examine each of the 24 Norse runic letters for meaning, mythology, and practical application of the symbolism in your modern life, all the while going deep into the ancient stories. They have relevance today. Who should you take this class? -You need a tool that translates, clarifies and/or validates information that you feel intuitively, what you already know but don’t have a rational explanation for that knowledge. -You are familiar with Norse runes but would like to expand your knowledge and deepen your practice. -You have some level of self-awareness and would like to work with your own personal soul path journey in a conscious way. -When you hear words or phrases like seer, intuitive, shaman, mystic, one who knows, you feel energized and want to know more. -You might already read tarot cards or use another type of oracle. -You took an abridged version of a rune course and want to have a more intense, detailed study. I am a shaman with a strong affinity for mythology. The old myths provide a source of well being beyond just a curiosity. I am heavily influenced by the works of Joseph Campbell and others who detail the hero’s journey, from the call to adventure to the meeting of allies and threshold guardians, and the return and assimilation of knowledge and extraordinary experience. There are similar themes that emerge in the study of the runes and so this course is conducted through that lens. You will learn techniques for accessing your own intuitive knowledge. In learning how to ‘read Norse runes,’ you will find your place in your own personal mythology. Many past students have incorporated a “rune of the day” into their daily spiritual and meditation practices and have experienced help with creative processes, getting un-stuck in a process of transformation, and finding hidden solutions to challenges. You will also be prepared by the end of the course to cast the runes for other people if that is something you want to do in the future. What about the warlike nature of Norse Mythology? How can this be a spiritual practice? Aren’t we above all this? While it is true there was a warrior ideal during the Viking Age, that is only part of the story. Second, we are learning this material in the modern era and there is a lot to be gained from incorporating knowledge of the runes into your life. We get a sense of connection to the sacred that is worthy and a helper even in contemporary times. What materials or resources do I need? An Elder Futhark rune set of 24 runes, an internet connection, and ability to connect to the Zoom platform for live weekly class calls via phone, tablet or computer. The use of Norse runes and the information learned throughout the year is for your entertainment only, though you will move further along your path to self-realization at the soul level. I look forward to talking at this event in Cork in April. Perimenopause takes place over the several years leading up to menopause. Frequently, it’s that time when women experience the most common symptoms of menopause. Since menopause takes place while women are still having periods, it off and sneaks up on them and leads to confusion – before their mid 40s, many women haven’t even heard of perimenopause. It’s not about the “pause, it’s all about the “Perry. Menopause is one of the few certainties in life for women, so get ready for it, mentally and physically. If you’re already begun, there is still much you can do to make your menopause years as golden as they should be. Where: Orchard Wellness Centre, Ennis, County Clare. Pre-Christmas mini retreat to refresh the mind, body and soul. · Do you need a break from the madness around you? * Are you feeling trapped in your daily routine? Here is a sneak preview of our last workshop!!! This event is a day for all women to enjoy some fun, pampering, relaxation and learn some new skills for their well-being. The day will consist of classes, demos, pamper stations and pop up shops. The hilarious and talented author Louise McSharry will M.C on the day! There will be pamper stations providing mini facials, hand massages, makeovers, hair styles, nails, reiki, reflexology and much more. Some of the companies include The Body Shop, Zen Wellness, JeJuve Aesthetics Ltd, Reflexology with Paula, Family Massage & Sports Injury Therapy Midas Touch Beauty Salon and Glow Beauty, Wicklow. There will also be hair and make up demos! We will have fitness classes from Orla Hopkins-Plant Orla Hopkins-Fitness Competitor, The Yogagym with Gemma Deeney, Barefoot Barbelle. There will be a mixture of wellness workshops and seminars which will include an EFT workshop, (Tapping for anxiety by Sarah Tobin), mindfulness and guided meditation from Mindfulness Schools Ireland. HOPE will have a stand on the day and some of their counselors will be available to talk on the day. We will also be including individuals who have had personal mental health struggles or experiences and are comfortable with speaking to others on a one to one basis on the day. CoolCrafts4All and Artbeat.ie will have craft workshops demonstrating how craft and art can help with anxiety and wellbeing. There will be some fantastic pop up shops and stands such as The Stork Box, Rubys Babytique, doTERRA Essential Oils, The Pod Collection, Younghearts.ie, , Skinfull Affairs, Earthmother, DoulaCare Ireland, Drake Chiropractic, Acuheal Clinic, The Navigation Coach, Count Her In, Our Wildest Days, Attipas Ireland, Pearl Bakes, Love Ink Paper Scissors, Mama Moments, and more! There will be a kiddies corner with toys, face-painting and sensory play from SENSEable Tots. Kids are welcome, but we encourage you to have some well-deserved me time! Bring a friend or family member and enjoy this Day of Hope! The event will be held in the Kingswood suite, Ballroom and Conservatory of the Citywest Hotel, Dublin, which is located on the red luas line and Saggart village. The Bar will be open in the venue and The Woodlock will have a lunch special on the day for €14. There will be amazing goodie bags for the first 200 entrants on the day. We will also be running a raffle with some fantastic prizes up for grabs. the raffle and goodie bags are supported by from those participating on the day as well as some other companies that can't attend such as mummy cooks, reuzi, Apfashion Nails & Beauty, Kerrigans Foods For Fitness, WaterWipes, Smock Alley Theatre, EPIC The Irish Emigration Museum, Spotlight Whitening, Madison Make-Up The Dublin Cookie Co., and more to be confimed. The day could not go ahead with all those taking part on the day but also the support of Bua Design, Truzees, Just-Print.ie, Big Boom Digital, Aoife Harding, Glitter Mama Wishes Blog, The Mammy Blog, Ciara.and.Saoirse, Delightfully Honest, Honest Mammy and more influencers helping and sharing behind the scenes. A night filled with workshops, holistic treatments, inspiring speakers, mindful music and some healthy nibbles!!! AND its in aid of Mental Wellness in Galway. Holistic Fest is an indulgent pamper evening in a beautiful venue for you to nourish your mental wellness, knowing every penny raised will go to helping people in Galway living with or recovering from mental health challenges. 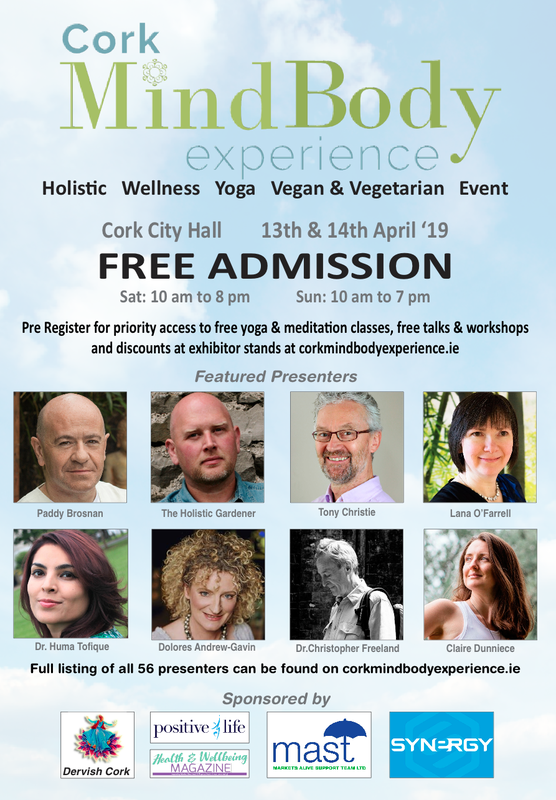 Tickets are just €25, your ticket includes a Sample Holistic Session of your choice plus access to an evening of Wonderful Workshops in the Buddha Deck & Inspiring Speakers. New Moon time is a great time to set intentions for what we want for the coming months. Depending on which sign the New Moon is transmitting sets the tone for what we can expect. Next week's New Moon is in Gemini. The energy of Gemini and the lesson we can mull over is how we can communicate more effectively with what we ourselves need so that we can then communicate this to others. We can often be reactive to situations that present themselves to us however if we can learn to lean into what we really need and come from there we will be more effective. Easier said than done ... I know! We will explore this topic in more detail at the FREE on line New Moon workshop next Wednesday evening. I will help you develop your own story and go through why you are doing what you are doing. When you are so clear on your story you will be better able to find your clients on Twitter. You can tweak this information if you want to use on any other platform as well of course bearing in mind that each platform has its own voice just like ourselves!!! The copy (story) you share on Facebook will not be in the same format as Twitter for example. A Piloxing and Piloxing Barre double, 2 hour extravaganza all for a great cause!! We a delighted to be hosting this event in aid of C.F. Galway Hospital Project. Tickets are €15 and all proceeds go to this amazing local charity group. Huge thanks to the team at HotelMeyrick for their support. Hosted by Health and Harmony, Loughrea, County Galway. Do you want to make 2018 your best year ever? Do you long to start a new job or business but not sure how? Are you experiencing overwhelm or burn out in your current career? Would you like to experience a more satisfying relationship with your partner? Are you longing to expand or start your family? Would you like more fulfilment and purpose? Would you like improved health and wellbeing? Have you dreamed of doing or having more in your life of whatever brings you pleasure? During this one day workshop you will learn how to structure clearly defined goals for the year ahead. By taking time out for yourself - away from every day stresses - you allow yourself time to focus on what is really important to you. Once you have these goals in mind you will find yourself becoming more motivated to make whatever changes are necessary to bring these dreams to fruition - whether that is in relation to your health, your career or your family. When you allow the imagination to run wild you can create whatever it is you desire in your life using your thoughts, senses, images and words. By spending a day with like-minded people you will draw on support from one another to craft and create a more fulfilling vision for your future. By compiling words and images that signify your heart's desire – and surrounding that image with whatever is necessary to bring it to fruition – you are building a powerful vision of exactly what you want your life to look like - something you can look at daily to keep you motivated. €75 per person - includes refreshments, lunch, board and all tools necessary to build your vision. Retreat from the world and restore your inner balance, during our Retreat to Tranquility, a One Day WorkShop at Creacon, Wexford brought to you by Irish Health Hour and Shiva Yoga. This one-day event is designed to encourage disconnection from your busy life, and create a state of mindfulness. You will effectively eliminate your stress, and restore your natural sense of physical and mental wellness. Our program includes yoga, aroma-dance, guided meditation and lunch from their "Food is Medicine" programme to sustain you through the day's activities. Book alone for a day of total peace and quiet, or with a friend who needs to get away as much as you do! Our Retreat to Tranquility is designed to fully relax and restore you, and offers an escape from the busy and connected lives most of us lead. Our skilled instructors will cater for all levels of ability, and the itinerary will energize you, restore you, and relax you through the course of the day. 11.00 Welcome followed by Vinyasa Flow Yoga - a dynamic and energising yoga practice linking movement to the breath. The practice will start with some breathing technics that can be used in any situation. Following this, you will flow through a series of invigorating sun salutations and the session will finish with some hip and hamstring openers. Suitable for all levels from the absolute beginner to a regular practitioner! 2.00 Aromadance Awaken your senses and reconnect with your body while you free your mind and open your heart through creative movement, absorbing inspirational music with your group while you utilize several different pure essential oils on your energy centers to relax your mind and create radiance. 3.30 Restorative yoga A relaxing and mindful practice. You will be led through a series of gentle passive stretches followed by a long and deep yoga nidra session where you will be guided into a state of total relaxation, also known as yogic sleep. @irishhealthhour is a unique networking community, encompassing all health and wellness related businesses, therapists and sports. A person’s health and wellness is about so many things; eating well, having our mindset attuned to what we authentically want; reducing our toxic load; exercising and generally living in the most beneficial way we can for our overall health and wellness. Irish Health Hour was founded by Dolores Andrew-Gavin, Author, Health and Wellness Blogger, Soul Care Practitioner, Reiki Master and Teacher, EFT Master Practitioner and Essential Oil Lover based in Galway, Ireland. Dolores is renowned for her Aroma Dance, Yoga and Reiki workshops and has just returned from performing Aromadance at the Goddess Temple in Glastonbury. Founded by skilled Yogi Mary Gardiner, Shiva Yoga Is based in Kilbeggan, Co. Westmeath. Mary and her team offer a range of classes and personal instruction to suit all levels of ability. She offers many variations of yoga including Ashtanga, Yin, Vinyasa and Kundalini. She offers specialised classes for schools, for pregnancy, for men, for elderly and for physically impaired. To bring with you: a candle for your intention. Pen and paper for journalling. I am also creating Alchemical Goddess Oracle Cards which you can work with on the night. Retreat from the world and restore your inner balance, during our Retreat to Tranquility, a One Day WorkShop at Temple Lodge and Spa, Moate, Co. Westmeath, brought to you by Irish Health Hour and Shiva Yoga. This one day event is designed to encourage disconnection from your busy life, and create a state of mindfulness. You will effectively eliminate your stress, and restore your natural sense of physical and mental wellness. Our program includes yoga, aroma-dance, guided meditation and luscious food to sustain you through the day's activities. Welcome followed by Vinyasa Flow Yoga - a dynamic and energising yoga practice linking movement to the breath. The practice will start with some breathing technics that can be used in any situation. Following this, you will flow through a series of invigorating sun salutations and the session will finish with some hip and hamstring openers. Suitable for all levels from the absolute beginner to a regular practitioner! Aromadance Awaken your senses and reconnect with your body while you free your mind and open your heart through creative movement, absorbing inspirational music with your group while you utilize several different pure essential oils on your energy centers to relax your mind and create radiance. Restorative yoga A relaxing and mindful practice. You will be led through a series of gentle passive stretches followed by a long and deep yoga nidra session where you will be guided into a state of total relaxation, also known as yogic sleep. @irishhealthhour is a unique networking community, encompassing all health and wellness related businesses, therapists and sports. A person’s health and wellness is about so many things; eating well, having our mindset attuned to what we authentically want; reducing our toxic load; exercising and generally living in the most beneficial way we can for our overall health and wellness. Irish Health Hour was founded by Dolores Andrew-Gavin, Author, Health and Wellness Blogger, Soul Care Practitioner, Reiki Master and Teacher, EFT Master Practitioner and Essential Oil Lover based in Galway, Ireland. Dolores is renowned for her Aroma Dance, Yoga and Reiki workshops and has just returned from a series of successful workshops at Glastonbury Festival 2017! Founded by skilled Yogi Mary Gardiner, Shiva Yoga Is based in Kilbeggan, Co. Westmeath. Mary and her team offer a range of classes and personal instruction to suit all levels of ability. She offers many variationsof yoga including Ashtanga, Yin, Vinyasa and Kundalini. She offers specialised classes for schools, for regnancy, for men, for elderly and for physically impaired. Temple Lodge & Spa is renowned for it's rejuvenating Mindfulness, Yoga and Wellness retreats. Temple Lodge also offer beautifully appointed bedrooms, a relaxing Vitality Suite, Studio gym, 10 treatment rooms and a state of the art Yoga studio. All of Temple’s bedrooms and facilities overlook the vast and private country side, giving you a sense of being away from it all, immersed in nature. Overnight and weekend packages are available at Temple Lodge and Spa by calling 057-933-5885. Free Meal AND Demonstration on how to make Curry Powder which you can then take home! 11 am - 2 pm for their Pop Of Pink Fundraiser in aid of Breast Cancer Research. The first 20 people in the door will receive a Pop Of Pink Gift. You will then enjoy light refreshments, with lots of amazing spot prizes up for grabs. "You will also have the opportunity to pamper yourself to a nail polish in a Pop Of Pink or enjoy an aroma hand massage while the kids are having their face painted. We also welcome you to come visit our new private Wigs At...Studio. Last year we raised €705 for Breast Cancer Research (Read more ->http://minimedia.ie/blog/2016/7/3/pop-of-pink-at-bellissimo-galway). We look forward to your support again this year with all funds raised on the day is in aid of Breast Cancer Research so all donations greatly appreciated for this worthy cause. Hope you can join us on the 30th June. Are you stuck in an old story and can’t seem to move forward? Have you spent years giving to others, to your career and now feel empty or unsure of who you are? Do you want to make today, the day you start to take control and start living the life you desire? The popular FREE Galway Meet Up is back, same time, same place just a different date! This month we have more wonderful speakers to give their knowledge to us on all things business, networking and being authentic! "The power of faith in your business"
Fidelma Greene is a Conscious Business Mentor who empowers highly conscious women who are feeling stuck, not knowing how to affect greater change in their life and business. Her clients have a desire to make a difference and are highly intuitive women. She acts as their midwife to help them birth their ideas to create more freedom, abundance and possibilities in their business and life as a Conscious Entrepreneur. This enables them to make a difference on purpose and build a sustainable business doing what they love.  take a leap into the higher version of themselves in their business and life. AND next we have Evelyn Pepperrell speaking on "Social media and Twitter visability"
Evelyn Pepperrell, Social Media Communication Strategist, specialises in providing clarity and manage social media accounts for time short solopreneurs. We specialise in tailoring packages around SMEs product/service requirements being mindful of branding, seo and business message. We are a growing business and continue to build profile in event & social media visability and connection for time short solopreneurs. Dolores Andrew-Gavin speaking on "Finding Your Authentic Story"
Dolores is a health and wellness blogger, founder of IrishHealthHour, Energy Therapist, Author and Mum. She helps people find their mojo when it comes to finding their own authentic story and writing about it, either for publication or just for clarity! We each have our own unique strengths and when we learn to hone in on these and come from this place when we are writing, then we will be able to speak authentically to the world. We don't want to write someone else's story, we want to write our own. However, we can hold ourselves back, consciously or unconsciously. Dolores works a lot with helping people delve into the emotional aspects of where they are stuck. Our emotions each have a lesson for us and when we learn what they are trying to tell us then, we can take the juicy part of that and work with it, rather than against it. Fear is not a bad emotion or one to be frightened of and, believe it or not jealousy is a fantastic emotion to show us our authentic path. It’s fun to delve into our emotional realm because we are diving into our own internal world where all our power is! By doing this we break through our own inner glass ceilings and begin to realise .. the world is our oyster! We will do some grounding exercises and learn a way to create a boundary to protect ourselves!!! Join me for a FREE webinar on ways to help combat stress in the workplace. Whether you work from your home office, a multi national company or are in the customer service front line we can all feel overwhelmed at times. Deadlines, bullying tactics, pressure with targets, your own personal story affecting your work, sickness ... there are all sorts of things that can get on top of us. Philip Shepherd. Philip is offering workshops and free public talk in Scarriff Library 23 rd Feb at 6.30pm. We all have emotions and, for most of us these emotions can be up and down several times in a day depending on what is happening around us. Would you like to learn ways to work with your emotions in order to stop creating the same old, same old story? The popular Galway Meet Up is back, same time, same place just a different date! "5 ways to inspire your way to more clients customers and profits - without being salesy"
Background: Moira helps small business owners and entrepreneurs who struggle with sales - inspire their way to more clients, customers and profits without being salesy. So they can have the increased profits they yearn for, that fuels a life they love ... doing what they love!" “She left her 9-5 job in London almost 4 years ago, to return home to Ireland to fulfill her dream of freedom by starting her own business. And in spite of having never owned a business before, she first built a travel business to attract visitors to her community in Donegal and then built a consistent 10K monthly revenue stream lightning fast from business coaching and intensive business retreats here in Donegal #Gnólecroí. And now helps others to fulfill their dreams with their own profoundly profitable business”. Moira's inspired, dynamic and successful brand of business mentoring shows entrepreneurs a bigger vision for their own businesses, and a powerful, authentic path to inspire their way to more contacts, contracts, clients and cash! She also books one-of-a-kind business retreats to beautiful Donegal, for entrepreneurs to refresh, renew, and rediscover the power of their own business vision. "How to Keep it Interesting - speaking about your business and making it memorable"
Melanie Boylan of STOMP Social Media Training is a Social Media Trainer, Consultant and Manager for business. Since her business set up 2013 she has built a healthy portfolio of business including with state bodies and helped raise clients profiles online by either training people in groups or 121 or managing their accounts for them. Please visit http://stomp.ie/melanie-boylan-social-media-training/ to learn more about STOMP and the services on offer. Margaret Lee mother to three grown up sons my husband Noelowns Connemara Organic Seaweed Company. I work as a swimming instructor for both children and adults, a job which i really enjoy. Growing up I was a keen swimmer and swam competitively for a good few years in my home country of Scotland. I've always had a massive interest in health and wellbeing and go to the gym and swim regularly. I love eating as clean as possible and since starting up our own Seaweed Company I have gained a whole new experience with food. I love cooking healthy meals and use Seaweed every day in some shape or form. I have also started making my own Skincare with seaweed and I am enjoying this project immensely. I make scrubs and butters containing Seaweed and Seaweed infused oil with Callendula, these products are natural and only contain 4 or 5 ingredients.I truly believe the way we eat has a huge impact on our health and wellbeing the same applies to what we choose to put on our skin. My aim is to show people how to incorporate Seaweed into their diet in a way that is both simple and using ingredients we would all have in our pantry. Carrigeen Moss Punch for colds. There will be some for everyone in the audience!! !